I’ll never forget walking into my coach’s office after practice. I had just finished a good day on the field, and I was satisfied. With confidence I expected a session of praise. My heart sank. Though I didn’t admit it at the time, he was right; I had become overfamiliar with my position, and I was losing the wonder of being committed to the game. As any good coach would do, he challenged me to evaluate myself and try again. He issued an invitation to be someone different. David C. Cook (2017). 352 pp. $22.99. Pastor Todd Wagner invites readers to experience the adventure, beauty, and fullness of life through the church as God intended. Obligated weekly services of mostly bored adults are not God’s vision for his people. Todd illuminates a path for readers to personally pursue a deeper relationship with God and then purposefully invest in God’s design for his church. This book paints the picture of the Father’s intention to bring his people into an adventurous life full of authentic relationships, powerful transformation, significance, and meaning. More at ease, I exited with a laugh and a hug. It was hard, but I was helped. I returned to practice the next day: same person, renewed vision. 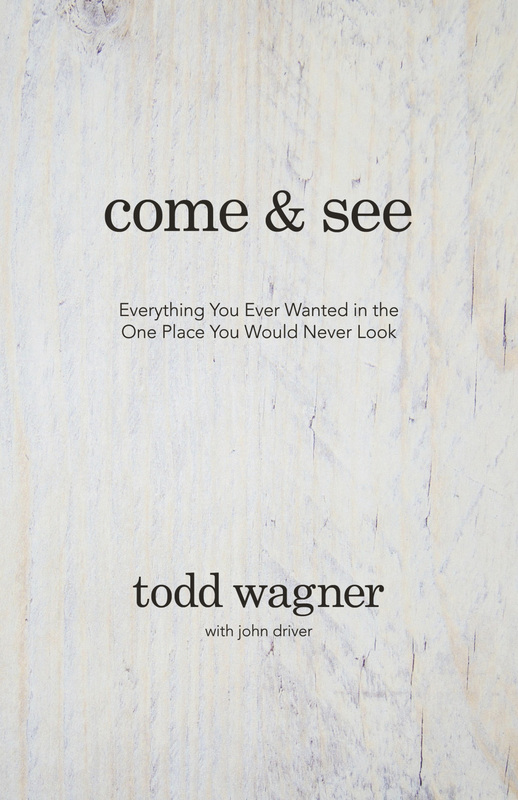 As my coach challenged me years ago, so Todd Wagner challenges Christians in his new book, Come and See: Everything You Ever Wanted in the One Place You Would Never Look. The founding pastor of Watermark Community Church invites us out of the bonds of the familiar to remind us God is alive and well—and doing amazing things in a place we may have overlooked. Where does Wagner invite us? To church. Not to any church in particular, but the church as God intended her. Come and see a renewed vision of the church. Go and be a renewed community called the church. Wagner offers two abundantly clear invitations: (1) come and see a renewed vision of the church; (2) go and be a renewed community called the church. But as Wagner explains, “Change begins with moving from ‘just me and Jesus’ to ‘all of us and Jesus. '” He calls Christians to move from mere attendance to membership (connection to Christ’s body) and discipleship (connection to Christ). He invites us to see the church as part of who we are—as provision, protection, and a place where we discover and use the gifts God has given us for ministry. It’s everything we want in the place we often overlook. Wagner doesn’t stop there, though. He invites us to go and be the renewed community called the church. Though many excuses are made to avoid godly community, God calls churches to be involved in “the greatest work in the history of the world”: to rescue lives, defeat evil, and bring peace. Far from limiting this work to evangelism, Wagner shows that integral to discipleship is fighting for a better end by working through conflict (173), pursuing peace (208), and deep transformation (264). As we go and be in these ways, we will invite the world to come and see God’s love in this renewed community called the church. Undoubtedly, this book is a needed corrective to American Christianity. Wagner does a wonderful job immersing us in Scripture as he invites us to a renewed vision. As I finished the book, I did see the church in a renewed way, but I found his conclusions incomplete and reductionistic at times. In various places he makes the “spiritual” seemingly the most important part of discipleship. To see Christian mission as limited to saving souls for heaven is to limit believers from working for justice at all levels (putting things to rights in the world), working for beauty (highlighting the glory of creation), and living out the future reign of God by partnering with him in the present. The book also has a limited view of oneness that doesn’t account for the types of diversity that should exist in churches (race, class, and gender), or the reasons churches lack such oneness. To call for “oneness” but not show what it should look on an individual, interpersonal, and institutional level can encourages churches to pursue superficial unity. Finally, the book has an incomplete view of why people avoid community. According to Wagner, people avoid community because of something wrong within them (for example, rebellion, arrogance, laziness, and so on). That’s often true, but he doesn’t focus on the fact that the problem is sometimes the community itself or its leadership. Despite these limitations, I’m glad Todd Wagner wrote this book, and I believe many will be helped by it. As I have been compelled by him, I now invite you: come and see.